Item 047 - Sturgeon Falls, Ont. 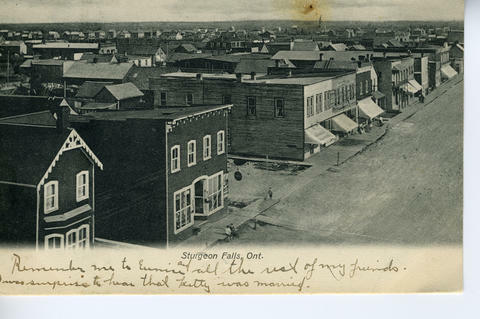 Postcard was cancelled at Sturgeon Falls on 31 August 1905. Card is addressed to: Mrs. Jennie Shoemaker. Herlrimer. N.Y. U.S.A. Message reads: Dear Friend. We leave here a week from to night and if the train stops at Herlrimer I will stop for a hour or two this is a great place here there is nothing going on at all. Yours truly Chas. [on the front] Remember me to Eunice and all the rest of my friends. I was surprised to hear that Kitty was married.